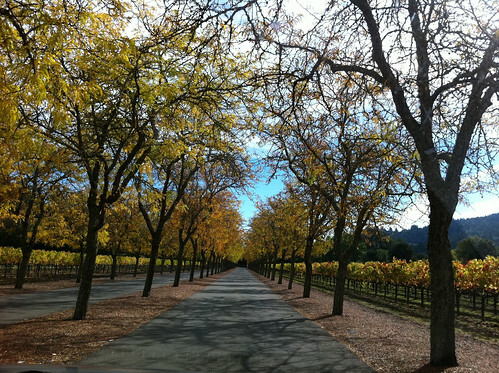 Today we drove the Napa valley, it's autumn , or fall as they say here and the colours at this time of the year are vibrant. First leg of the drive was from Santa Rosa to Calistoga and the first stop of the day was at the Petrified forest fallen and covered by ash by the eruption of Mount St Helens many years ago there are some well pressured trees now of stone, an enjoyable first stop. Next stop Calistoga an next little town with what seemed like a large proportion of quality restaurants. Just south of there Sterling Vineyard, now this vineyard looks very very nice but $25 per person for a ride in their "air tram", cable car to the rest of us, up a small hill to the cellar doors for a tasting … well no thanks we will pass thats a bit steep. A drive on the the town of St Helena and surrounding view is great, a nice town with foodie and homeware stores, some olive oil and balsamic tasting. Further down the valley we stopped at Beaulieu Vineyard at Rutherford for a tasting purchased the Chardonnay and the Beauzeaux red blend. On Robert Mondavi winery toward Oakville, a very picture postcard winery, some more tasting and purchased a Fume Blanc , now consumed for diner. and a Pinot Noir. On to Yountville and Vintage 1870 no wine for us here but a great little art gallery Blue Heron with some fantastic photos. Final stop for the day was Oxbow Market in Napa itself before we headed back to home base in Santa Rosa via Sonoma and the Sonoma Valley wineries. A great day out. An interesting observation a tasting fee, whats that about, and a tasting fee thats not waived when you make a purchase. We have had the privilege of having been able to taste wines as some of the best regions in the world including Bordeaux, Burgundy, Pyrenees, Margret River, Barossa Valley and Coonawarra. We didn't taste anything that warranted a tasting fee , sorry Napa Valley thats just poor form.